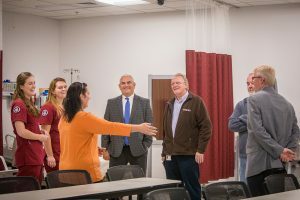 Wohlsen Construction Company and Eastern University celebrated the recent completion of the university’s new home to their nationally accredited nursing program. Nursing students shared key features of the new space during tours given to faculty, staff, and guests. Designed by Derck & Edson Associates, the project involved turning 14 faculty offices on the third floor of the occupied McInnis Hall into a state-of-the-art learning and training center. The new nursing space provides the team with two nursing labs, two high-fidelity simulation labs, a control room, a debriefing room, a collaboration zone, an office, and various support spaces. 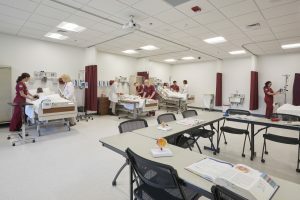 Eastern University’s state-of-the-art nursing center comes at a time when the need for well-educated nurses is on the rise. As the country’s population of elderly continue to grow, it is estimated that the number of nurses will have to increase 16% by 2024 to keep up with demand. The completion of this timely project occurred during the spring semester as students attended classes in the surrounding rooms. As a result of the team’s dedication, expert planning, and skilled craftsmanship, the project was completed with as little disruption to the building’s ongoing operations as possible five weeks ahead of schedule.